In traditional Chinese culture the number Seven connotes harmony. 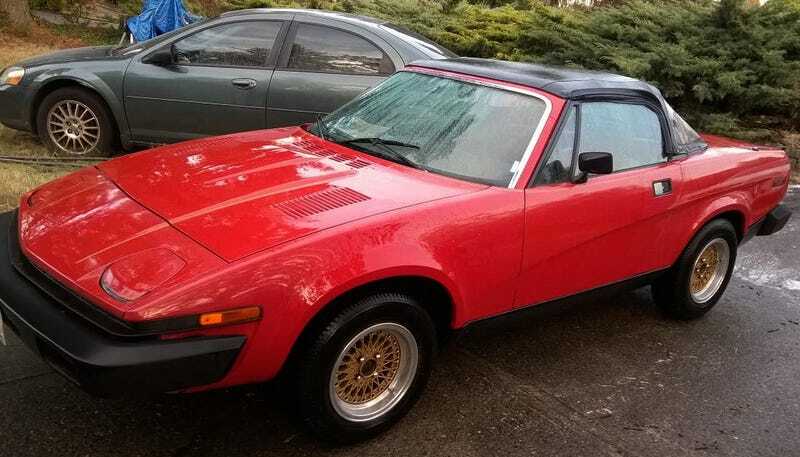 Today’s Nice Price or Crack Pipe Triumph is an amalgamation of sevens—TR7 and, likely, RX7. Let’s find out if that mix makes its price harmonious as well. Few of you flipped your lid over the price of yesterday’s rare as rubies 1989 Toyota Soarer Aero Cabin, even despite the fact that it would flip its lid over you. A full 73% Crack Pipe loss closed the book on that factory one-off. Think about it: there are seven days in the week, seven seas, seven colors in the rainbow, and seven movies in the Star Wars canon. That’s got to mean something, right? Seven wasn’t so lucky or influential a number for the classic English marque Triumph as its Seven, as in TR7, sadly took the venerable TR line into uncharted and extremely unreliable waters. Now Seven, on the other hand, proved highly profitable for Mazda as the company anointed their second rotary-powered sports car effort with the RX-7 moniker and the rest, as they say in history class, is history. This 1981 Triumph TR7 rocks a Mazda 13B, most likely out of one of those lucky Seven Mazdas. It also sports a five-speed stick from the same car. That’s an interesting choice and likely far more fun to spin than the 92-horse 1998-cc SOHC four-cylinder that Triumph originally put under the iconic wedge-shaped bonnet. Let’s talk a minute about that wedge. The TR7 was not an evolutionary advance on its predecessors, but a revolution, and not a good one. It offered styling tropes with no precedent, and very honestly abandoned everything that was cool about its 2 through 6 predecessors. The TR7 was initially offered in a single door stop-looking coupe model, a decision based on an expected ban of convertibles in Triumph’s most important market, the U.S..
That ban never materialized and four years after the TR7's launch the company released a drophead model that at the very least carried on the open air traditions of those numeric forebears. It also worked wonders on the Seven’s styling, turning what was once a dowdy coupe into a almost exotic looking sports convertible. The only equatable transformation is that of Rachael Leigh Cook in She’s All That. And the Triumph’s is better because it has pop-up headlights! This ’81 is a droptop and from the look of things, that top might need to be dropped. It’s not too bad, but the packing tape apparently holding one of the plastic windows in place might be a little too redneck for most people’s taste. There’s also some wiring that needs attention—I know, on a British car?—go figure. A tip to the seller, you might have wanted to tuck all that in before taking the interior pics. There doesn’t seem to be any rust anywhere, and with the exception of one headlight cap, the paint looks decent. Mileage goes undisclosed. But the big story here sits under the hood, and that’s the fuel injected 13B. You can hear it run in the video below, and it doesn’t sound half bad. At the very least it runs and there’s no fart can so you wouldn’t have to feel ridiculous driving it home. The seller says that he’s had the car for about 10 years, and that a previous owner did the conversion. He says it runs stops and handles really well, but that he has not had the chance to drive it much in those 10 years. He also says that a divorce is forcing the sale. Sorry about that, buddy. The price is a manageable $1,995 and I’m going to let you in on a little secret, one that I hope doesn’t cloud your vote: if it were closer to me, I’d buy this odd bodkin. Okay, ignore what I just said, because it’s now your chance to say whether you think ANYONE should buy it at even that $1,995 price. What do you say, is that a deal to get lucky with some Sevens? Or, does that price make this car a triumph in name only? H/T to Oblio for the hookup!